And I’m back! After way too many long months of cookbook writing (and some health-craziness that I am still wading through) I am finally ready to get back into my kitchen! 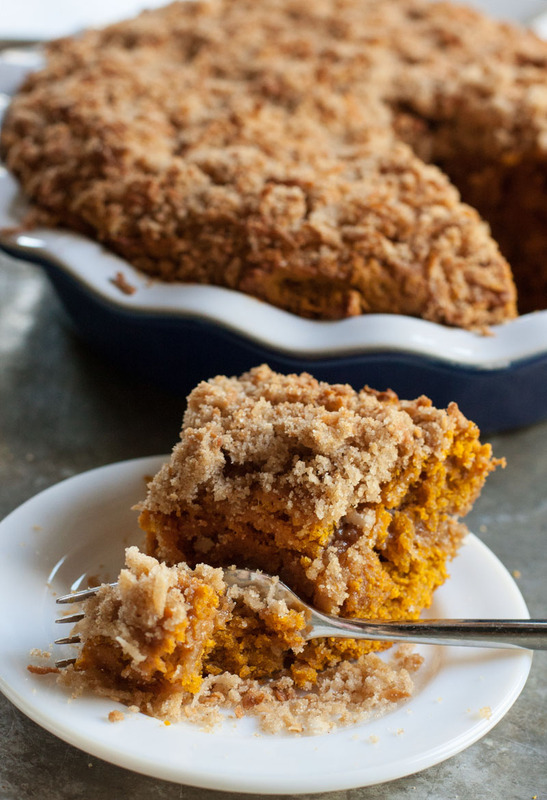 This easy pumpkin coffee cake was the perfect way to ease back into things on this last-day-of-summer-that-feels-entirely-like-fall. Why dairy-free? Well, let me fill you in. My dairy-loving norwegian-self just found out that my body really can’t process dairy. Yes, there were lots of tears shed. No, there is no pill I can take. And yes, I actually feel MUCH better already after just a few short weeks of this journey. Am I happy about this turn of events in my life? Not one bit. Am I excited to actually feel good after spending way too many years of my life feeling ‘meh’? Absolutely! So, we journey on. Yes, there will absolutely still be dairy involved in the recipes on this blog, but you will see more and more dairy-free recipes as I adjust to my new normal. 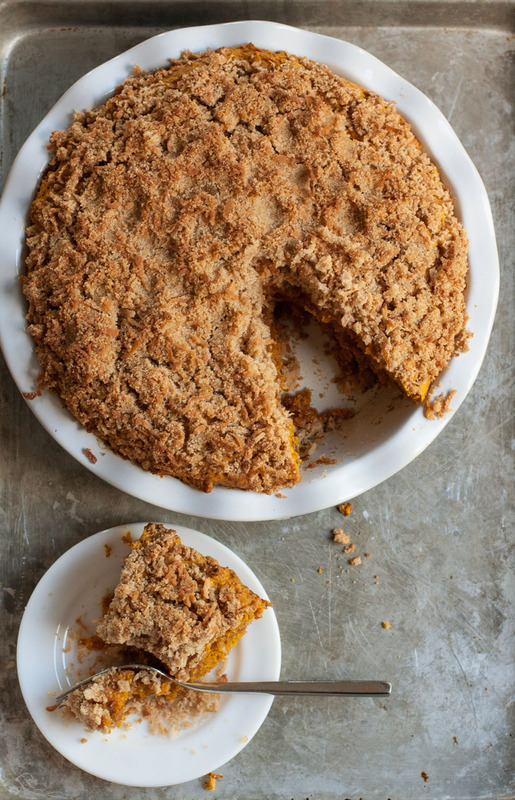 With fall strongly in the air today, this coconut-streusel laced coffee cake was a no-brainer on the list of recipes I needed to convert first. No dairy at all, but not missing a bit of flavor, you are sure to love this easy fall treat as much as I do! Preheat the oven to 350ºF. Grease a 9x9" square baking dish (or a similar size pan - I used a very deep dish pie plate! ); Set aside. In a medium bowl, stir together the streusel ingredients until combined; Set aside. In another medium bowl, stir together the flour, pumpkin pie spice, baking powder, cinnamon and salt for the cake; Set aside. In a large mixing bowl, mix together the 1/2 cup coconut oil and 1/2 cup brown sugar until well blended. Stir in the pumpkin, and then beat in the eggs, one at a time, until just well combined. Stir in the flour mixture until just combined (don't over-mix!) and then spread half of the pumpkin batter into the greased baking dish and then top with half of the streusel mixture. Carefully spread the rest of the batter on top of that, and then sprinkle evenly with the remaining streusel. Bake for 45-55 minutes, until the top is golden and a toothpick inserted in the center comes out almost clean, with just a few crumbs on it - no wet batter. Let cool a bit before cutting and serving, if you can stand it! « The Best Back-to-School Lunch Containers… and other fall ramblings!